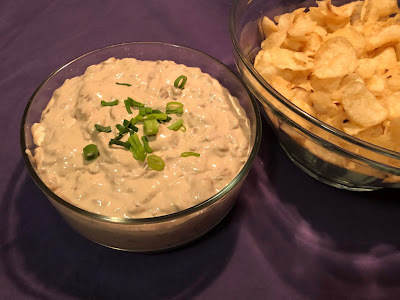 When you think of onion dip, just regular basic onion dip, you usually think of mixing sour cream with onion soup mix, correct? It's been one of those standard no-fuss recipes that everyone has made for ages and ages, and it always goes over well with a bowl of potato chips. But what if we take that onion dip and turn up the volume?? This onion dip is absolutely MILES ahead of the old stand by as far as flavor is concerned. It just has a depth of flavor that you just can't get from a box of soup mix. Think of it as the difference between fresh vegetables and canned vegetables. There's just no comparison, right? So, for this onion dip, it's kind of like that. Plus you get the added bonus of skipping all that extra sodium. It takes a little bit of time, but it's really worth that extra effort to develop those deep flavors. And it's a total do ahead, so you'll wind up saving time in the long run. This is my tweaked version of a recipe I found on a blog called Home Cooking Memories. If you like onion dip, then this one is definitely next on your must-do list! Chop the onions down to small dice. Melt butter in a large heavy pan over low-medium heat. Add the chopped onions and let them slowly caramelize. Don't rush this step! This will take a good 20-30 minutes. Every few minutes, give it a good stir to make sure it is not sticking to the bottom of the pan. When the onions have turned a dark-amber color, stir in the garlic and continue to saute for a few more minutes. Add the whole bottle of beer. Stir again to make sure nothing is stuck to the pan. Turn up the heat just until it comes to a boil, then reduce the heat back down again to simmer. Let it simmer until just about all of the liquid has evaporated. Remove from heat. Set aside. In a large mixing bowl, combine the remaining ingredients until smooth and creamy. Stir in the onion mixture. Place the bowl in the fridge until chilled. Just before serving, give it a final stir, just to make sure it's all creamy and delish. Garnish with a few chopped scallions, if you like. Serve with your favorite potato chips. Ok, let me say this again because I can't stress it enough.. do NOT rush cooking the onions! Just let them go low and slow. Perfection takes time!! It's a MUCH bigger pay off in the end! You decide how dark you want them. I like to let them go very dark, almost brown. The flavor just gets deeper and deeper as you go. You can use a food processor to chop the onions, but I prefer to do them by hand. I like to be able to control the size of the dice, and it's one less thing to wash. Besides that, you don't want them to be too finely minced because then they'll nearly disintegrate as you saute them. A little texture is a good thing! If you're not sure how to do them by hand, just watch my video How to Cut an Onion ! The original recipe said to completely cool the onions before mixing them into the creamed mixture. I didn't, but just chilled the whole thing after. It's still fabulous either way. For an extra added twist, try adding a a few pinches of fresh thyme leaves as you saute your onions. It gives another layer of flavor that really goes well with sauteed onions! Yum.